Why Robot Startups Now? part 2 – LET'S TALK ROBOTS! A positive indicator for robotics startups is the improving financial climate. There are signs that the US housing market is stabilizing. Fannie Mae, the government backed mortgage company, has posted a profit for the first time since 2007 without needing a government bailout. The decline in home prices is slowing, as are mortgage delinquency rates and the rate of American home purchasing is on the rise again. While this is a U.S. centric view and some of Europe is still in financial crisis, nonetheless China and S.E.Asia are surging and many African economies are showing very promising proportional growth rates. There are other sources that describe the current world economic status but it’s no longer a bad time for a capital intensive industry like robotics to grow. Particularly if business models lower the risk by utilizing lease models or the rapid cheap trial and error methods of startups. Where Defense budgets are tightening on traditional robotics, like unmanned systems, the Whitehouse is committing spending towards other newer robotics growth areas. All this indicates that robotics is ready to support itself as an industry, rather than be supported as a research project. Legislation is being passed allowing the introduction of driverless cars and by 2015 we may see changes permitting the commercial use of small drones in U.S. airspace. Rodney Brooks, founder of iRobot and current CEO of Heartland Robotics, is one of many expressing the view that robotics has progressed beyond a cool new research area and into the world of robot products. While making new discoveries is exciting, there isn’t enough effort going in to using those same exciting new technologies in everyday applications. So, the question now isn’t what robots can we build, it’s what can we do with the ones we’ve built already. The robots that are successful products seem simple and boring, eg. industrial arms, vacuum cleaners, cars. But when applied to the right problem, even simple robots are transformative. The first successful consumer robot was of course iRobot’s Roomba vacuum cleaner with more than 7 million sold worldwide. But the biggest acquisition of a robotics company was Amazon buying Kiva in March 2012 for $775 million. 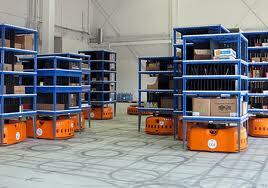 Kiva’s system relies on small orange turtle like robots that move shelves around in warehouses. The brains are largely on servers. The robots aren’t ‘cool or exciting’. They are barely even robots. But they solve the problem that sank WebVan, one of the most spectacular e-commerce failures. You can only do half your e-commerce in the cloud. Somewhere real products have to be shipped to real places. Amazon, like WebVan, has to ship product. Reportedly, phsyical order fulfilment cost nearly 9 percent of Amazon’s $40 billion global revenues. This is a big enough pain point for some companies to be willing to trial the Kiva System in a few locations, especially smaller retailers, like Staples in 2004, who faced increasing competition in cloud commerce. Jeff Bezos from Amazon is also investing heavily in Heartland Robotics. Brooks has a vision of transforming the workplace by making robots that can be safely worked with, shifting robots out of sterile, safe factory environments and bringing them alongside people. His analogy is with mainframe computer systems in the 1960s to the personal computer of the 1980s. The future of robotics is exciting, but we’ve barely begun to fully explore the potential of the simple robots we already have. Nice post. Will you elaborate more on the lease model for robotics – there’s something important here, in terms of reducing adoption risk/fear. And Rodney Brookes’ comment on user’s just wanting to get a job done (not caring about cool robots) has direct corollaries in the disconnect between software engineer enthusiasm for software and patterns, and the same wish by the end user to ‘just make my life easier’, without details. The leasing model is proving successful for robotics companies in the health sector, as it avoids some liability or legislative issues by inserting a service industry between manufacturer and final customer. Also, over the course of time leasing business models offer more revenue and fewer risks for investors. Giraff is an interesting example of this. I think that Lean Startup Methodology and/or industrial and UX designers are important steps in bridging the gap between ‘what the product can do’ and ‘what the product can do for me’.